Image caption Paddy Power described Sportsbet as "a cracking business"
Irish bookmaker Paddy Power has agreed to buy the remaining shares in Australian betting company Sportsbet, giving it full control of the group. Paddy Power will pay 132.6m Australian dollars ($133m; £86.2m) for the 39.2% stake that it does not already own. Paddy Power first bought 51% of Sportsbet in 2009. The overall buyout, which increases its exposure to online betting in Australia, is expected to complete by the end of February 2011. 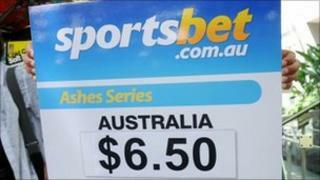 Paddy Power will pay an additional A$25m if Sportsbet's 2013 earnings exceed A$80m. The Irish group said it expected the acquisition to start increasing earnings in 2011. Patrick Kennedy, Paddy Power's chief executive, described Sportsbet as "a cracking business". "The team has made great strides in marrying the best of both Sportsbet and Paddy Power," he said. "This is a good deal to acquire the remaining shares early, which will allow us to drive development and investment and secure full participation in the upside of the business."